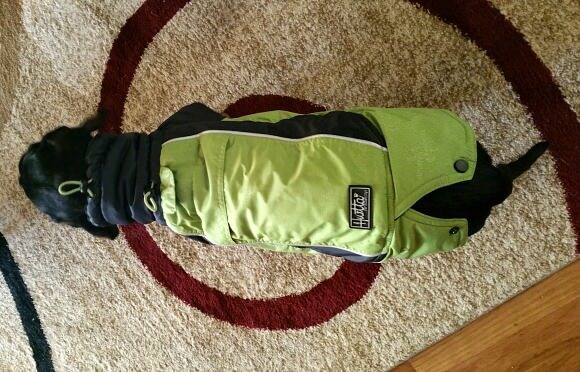 You are here: Home / Reviews / Dog Stuff / Never Fear: Sizing for Hurtta Dog Jackets is Easy! I get a TON of questions about Chester and Gretel’s Hurtta waterproof dog jackets. 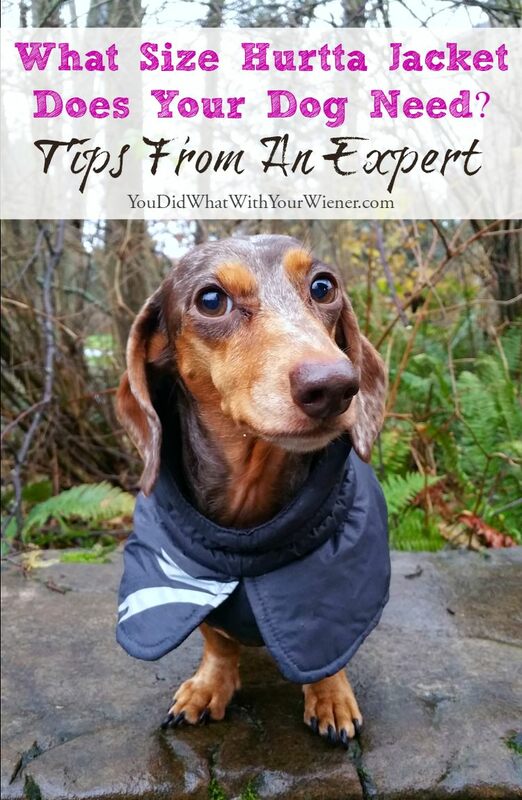 Our readers primarily discover them through our Best Jackets for Dachshunds or I’m Throwing Out All of Our Jackets Except These articles or by seeing them in our Instagram photos. I like that you guys are interested in them, and I really do like helping you out, but I find myself answering the same questions about sizing a couple of times every week. To make sure I don’t forget anything, and so I can leave the link next time someone asks me, I wrote this handy “little” guide. I say “little” because, as you can see, there is quite a lot of information here. I tried to cover everything I get asked and arrange the information according to the questions. If your question is not answered here, please feel free to ask on our Facebook page, or email me, and I’ll get back to you (and also add it to this post… so really, you’re helping me out). 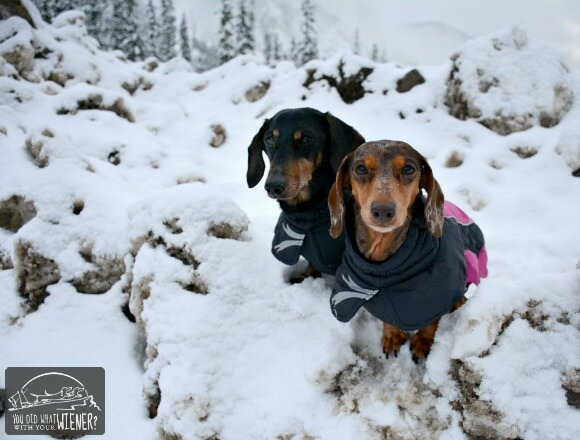 Note: As Hurtta ambassadors (they’ve provided us jackets – although I’ve bought some too – so Chester and Gretel stay toasty warm while proving small dogs can be adventurers) these jackets are something I’ve come to know very well over the last couple of years. What Size Jacket Should I Get My Dog? I often hear that their sizes are confusing. Why exactly I’ve never been able to figure out. I think it has to do with the fact that the brand is from Finland. They are probably using European sizing converted to US sizing. It’s kind of like wearing size 8.5 in shoes but going to buy yourself a pair of Italian-made hiking boots. You’ll usually have to convert your 8.5 US to something like 38 EU. When people send me questions about size, the first thing they do is tell me what their dog weighs. Then they ask me what Chester and Gretel weight. I know they are looking for some kind of reference but a dog’s weight doesn’t tell you much. A 11 lb dog can vary widely in the measurements that count – neck, back, and chest – even among the same breed. That being said, another Dachshund is unlikely to take a jacket 3 or 4 sizes larger than Chester and Gretel’s. If you want to know what size they wear, skip down to the bottom section (but don’t forget to come back up and read about how to measure YOUR dog). You will need 3 to 4 measurements to choose the right sized jacket for your dog. Watch this quick video to see how to measure in the right places and then read my descriptions below for more details. 1) Neckline: The measurement should be taken at the base of the neck – this being the widest part. When measuring, place the tape right where your dog’s neck attaches to their shoulders. 2) Back Length: The dog should me measured from the withers (between the shoulder blades) to the base of the tail while the dog is standing in a normal position. If your dog is like Gretel, she “noodles”, or collapses/rolls over for belly rubs, as soon as I try to put the tape measure on her. It’s important to measure your dog’s back length while they are standing in a normal position. The easiest way to get a straight-line measurement is to use two people. One person holds on to the dog’s back foot lightly, and holds a treat out in front of them, causing them to stretch forward a little to reach it. The other person does the measuring. Measure multiple times and choose the most common (2 out of 3) or the longest one. If anything, this might result in a measurement that’s a 1/2 or so longer than your dog is when standing in a relaxed position. However, in my experience, it’s better to have a jacket that is a little longer rather than shorter. 3) Chest: The measurement should be taken at the widest part of the chest, usually right behind the front legs. This sounds pretty straightforward, right? Well, not necessarily. The dog in the video above has a pretty uniform chest – similar width beginning to end. Dachshunds, Greyhounds, and other deep-chested breeds have quite a curve to their ribcage. It’s a little narrower behind the legs, widest just behind that, and then tapers quickly as it extends toward the abdomen. Personally, I suggest measuring your dog and the TRUE widest part of the chest. That’s not always right behind the front legs. If you are purchasing a jacket, you can stop reading. However, if you are purchasing something like a suit that has legs, you’ll also want this next measurement too. 4) Front Leg: The length should be measured from the bottom of the rib cage along the inner side of the leg to the wrist bone (just above where the paw starts to bend). I Have My Dog’s Measurements. Now What? Once you have your dog’s measurements, you will need to consult with the size charts. Beware that the size chart can vary slightly based on which jacket, or product, you are purchasing. Be sure to view the product you want and then click “size chart” on the page to see the proper one. Also beware: I’ve found that some third-party vendors use just one size chart for all of the Hurtta items they carry. My suggestion is to definitely check the size chart on the Hurtta website before choosing a size off a different website. Below are the size charts for the 4 jacket models that Chester and Gretel own, taken directly from the Hurtta website. In my opinion, the back length is most important. The Summit is the most adjustable in length (by about 2.5 inches in the size 14) and the Extreme is a close second to that in length adjustability. The Torrent and Ultimate cannot be adjusted for length, although there is a bit of wiggle room there. Definitely keep in mind the chest measurement though and don’t get a jacket that is way too big. The chest size is adjustable but there are limits. I think it’s important that the jacket fit as snug as possible around the chest without being restricting. This is important because, if the jacket gapes around the chest, your dog’s foot or toenail can get caught inside the jacket and trip them. Of course, this is more likely to happen if you have a dog with short, stumpy legs like a Dachshund. It’s less of an issue with taller dogs. 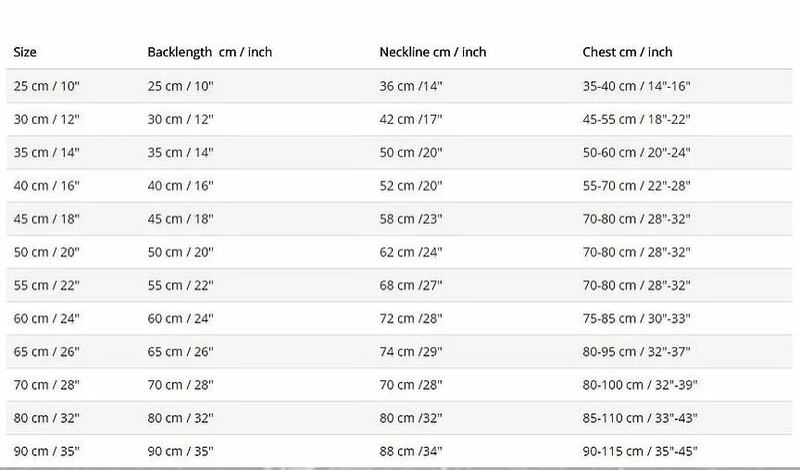 The size chart offers a chest range but, in my experience, it can be tightened to 1/4″ to 1/2″ smaller than even the smallest measurement listed. The neck size is very adjustable. The Torrent Raincoat, Summit Parka, Ultimate Warmer, and Extreme Warmer are all adjustable around the neck. I was able to cinch the neck hole down by 2 or 3 inches on Chester’s Summit Parka. If you are buying an overall with legs, know that the size chart assumes you have a regular dog with regular sized legs. I’ve seen a few long and wire hair Dachshunds wear the overalls with, apparently, no issue. It looks to me like their fur keeps the jacket cuffs in place. We tried a few but the legs were too long for Gretel and wouldn’t stay “pushed up” because she has a slick coat. Her legs kept going back up the sleeve and getting caught. I’m not saying one won’t work for your slick-coated Dachshund but just keep our experience in mind. note: I’m in denial about it not working so we are going to give it another shot later. What Size Do Chester and Gretel Wear? Like I said, a dog’s measurements can vary widely. Instead of giving you Chester and Gretel’s weight for reference, I’ll give you their measurements. Gretel wears a size 12 in all of the Hurtta jackets we own. As you can see by the charts above, her back is actually 1-1.5 inches longer than the recommended back length for a 12. All of the jackets JUST fit her length though. There is plenty of length with the Extreme Warmer. The summit parka doesn’t snap behind her rear like the other jackets do so the length is not as much of issue. It would be nice if the Torrent Raincoat and Ultimate Warmer were a 1/2 longer for her but they cover her bum just fine. The neck size listed for a 12 is 17″ – way larger than her neck actually is. They fit her perfectly though with a little cinching. A size 14 would be way to big for her. Chester wears a size 12 in most jackets too but they don’t fit him as well as they do Gretel. Some are a tad too small for him but the size 14 in the same jacket would be way too big. “Too small” doesn’t make the jackets “fit bad” though. They work. He wears a size 12 in the Ultimate Warmer. I can’t snap it behind his bum though because it’s too short for him. With the flaps opened up though, it does cover his whole back. He wears a size 12 in the Torrent Raincoat and the Extreme Warmer. They fit him perfectly. He does wears a size 14 in the Summit Parka because the 12 is just too small. The size 14 is definitely big for him but it works enough when the chest and neck are tightened down all of the way. The summit is not our favorite of the jackets anyway so he doesn’t wear it often. Anyway, I hope all of this helps you find the right size for your pup. Thanks for this, it was very helpful! I’ve been eyeing Hurtta for quite a while for Nola. She’s the same chest size as Gretel but is 10″ in the neck and 12″ in the back. I like the Ultimate Warmer look! I was sick the last couple of days but I saw your comment come through. You’re fast 😉 I think the 12 wold definitely fit Nola. Like I said, it’s just barely long enough for Gretel so It would work better for Nola since her back length isn’t as long. I know the neck measurement says 17 inches but I barely tighten down the bungee for Gretel. I like it to fit her lose. I just checked how far I could cinch the neck down. I could make it losely fit my wrist… which puts it about 8 or 9 inches in diameter. Hope that helps if you decide to get one. That jacket looks very cozy and also very stylish! Might have to purchase one for my pup as well! Do you have knowledge about standard dachshunds? My Sadie has a 13+” neck, her chest is 23.5″ and back length is 17. Her numbers are all over that chart!! Back length 17″: This is one of the most important measurements to fit. It’s also better to err on the side of longer than shorter. The Summit Parka and Extreme Warmer can be adjusted by about 2 inches in length (shorter). Looking at the chart, this would put your pup at a size 18 or 20. Note: a size 16 could also work but you may have to leave the back flap unsnapped. I would measure your pup again to make sure they are not a little less than 17 inches. Chest 23.5″: The next most important measurement. The size listed in the charts is a range and the jackets can usually can be adjusted to be at least a 1/4 smaller than what is listed. According to the chart, your pup would need a size 16 or 18. But, since you are ok with the chest part fitting a little looser so as not to mat the hair as much, and a size 16 is a tad too small in the back, you would probably want size 18. Neck: 13+”: The neck is adjustable by 2-3 inches easy. Also, it won’t fit tight around the neck like a collar so an inch or two bigger is totally fine. 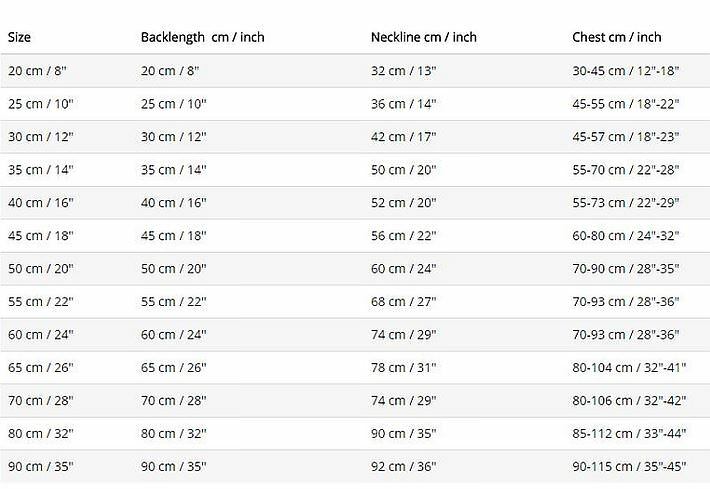 The neck measurement listed for a size 18 is 22″. BUT, because it can be adjusted down to approximately 19 inches, and fitting loose is ok, it would work. If you want a tighter fit, or are looking at the Extreme or Ultimate Warmer I would go with a 16 since the 18 would be way too big in the chest. Hi Dawn. I’m sorry you go the wrong size and I’m sorry you’re having trouble finding the information you need. I assume you already looked at the packing label and the information was not there. I’ve been told that a customer who bought an item from the Hurtta North American website can have the item replaced for free to a smaller or larger size. I believe all you need to do is contact them. According to the contact page on their website, there are two ways to contact them – info@ackuniversal.com and phone 561.227.4092. Have you not had any luck with these? So looking forward to getting my Bruce one of these extreme jackets. Thank you so much. Wanted to get your opinion on size… reading yours was very helpful. I was looking at the Extreme Warmer for my pup. My dog measures 17.5-18 inches (length), 14 inches (neck), 21 inches (chest). I was thinking the 16 inches would be best, and 18 inches would be too big. What do you think? Hope I can help. That’s a tough one. Normally, you want to base your choice on length because you can’t make a jacket longer. Gretel is about 13.5 inches in length but the 12″ JUST fits over her bum… so there is an inch or so to play with in the length. Since your pup is at least 17.5″ long, the 16 could barely fit like on Gretel. I highly suggest measuring his back length a few more times to try and get a more accurate measurement. If he’s longer than 17.5″ then you probably want to go with the size 18. Chester’s neck is 13″. He has to wear a size 14 jacket because the size 12 isn’t long enough for him. It’s super baggy but I can cinch the 20″ neckline down to fit him, which is a difference of about 6″. Going by that, your pup would be fine in the 16″ for his neck but the 18″ might be too big. Chester’s chest is 17″ and I can tighten the strap to on the size 14 make the 20″ (listed min) waist fit him. That’s a difference of 3″. For your pup, the size 18 might not cinch down small enough. If you are ordering directly from Hurtta North America, I would email them for advice. If it were me, I would buy the two sizes, try them on, and return the one that is too big (check the return policy to make sure you can – I know you can with Hurtta North America). If I had to guess…. if you remeasure and your pup’s back is definitely 17.5 ” long or a little less, I would go with the size 16. If he’s any longer than 17.5 inches, I would go with the 18. I used to have a solid Brown one that I would put clothes on lol, his name was rusty.